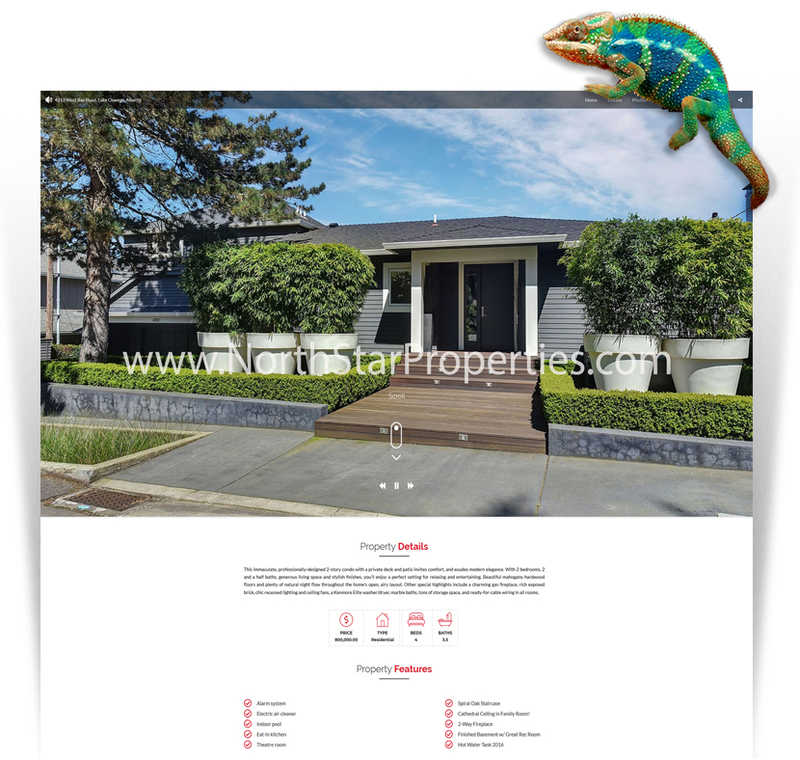 "New Property Listing Webpage Themes"
Agents now have more tour webpage themes to choose from and more coming. Our certified photographers and videographers can add multiple media to these new themes creating a stand alone stunning presentation to both home buyers and home sellers. The word "Chameleon" means just that. Agents can change color schemes dark or light to match their own branding. All themes are designed for all browsers and tablets. We have also designed a beautiful mobile version to showcase each presentation. A nice added feature to all our themes is a free Youtube video for agents to use on all their social sites. Call a certified local MVL photographer near you to order your "Property Listing Webpage". This is designed for the agent who wants everything. You can showcase 3 main tour photos in this theme along with presenting the listings' top ten features. If you don't want to show the price, no problem. Get the phone ringing or emails coming with our new "Call For Price" option. This theme is perfect for adding an Aerial or Home video from one of our drone certified videographers. This theme is almost identical to to Luxury 1 but with a little twist. Some agents wanted a more visible property address, open house and welcome introduction and this theme has delivered just that. Luxury 2 also gives the viewer the same welcoming presentation of the listings top 5 images, property details and features. You can still add any media to this theme such as 360 panoramic scenes, Matterport 3D models, floor plans and our free YouTube video walk-through. This is our newest theme and very similar to the "Luxury #1" theme but with a few more displaying options. 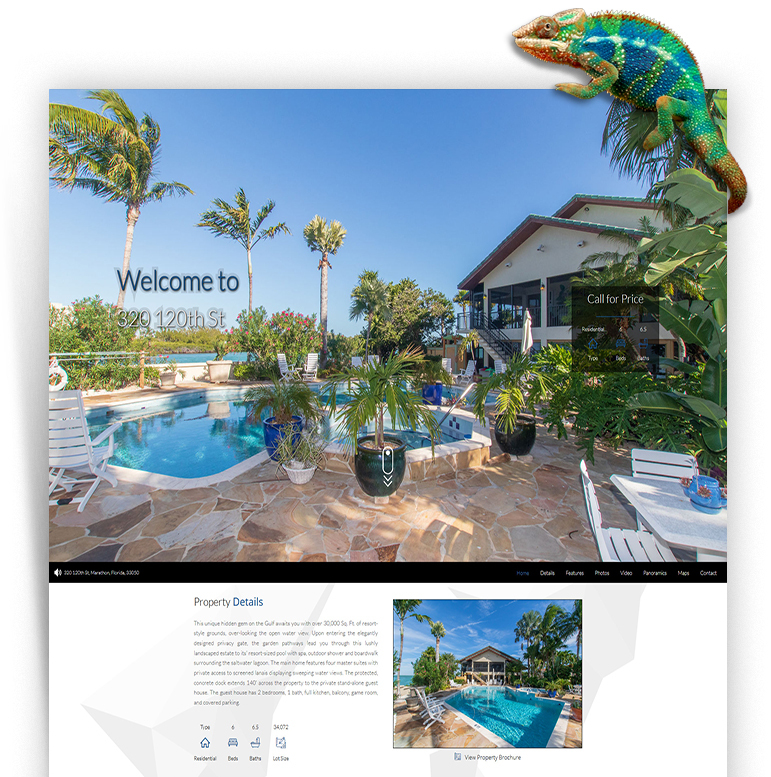 While Luxury 1 has just 3 main images rotating at the top, this theme was built for the agent who wants to showcase the "Video Walk-Through" or photo slideshow right at the top of the presentation. This video walk through is automatically created from your tour photos, agent profile picture and brokerage logo. Curb appeal and 1st impressions in real estate are very important and all our themes are creating an eye-popping and engaging single property presentation. This theme was our 1st chameleon tour theme and the reason why we created these themes. The days of old boring virtual tours are gone and our new designs are becoming the premier way to present listings online. Finally a platform to get photographers and videographers more business. This is a perfect theme for a custom real estate video. Our videographers have been looking for a nice presentation template to showcase their work for a long time now and this theme solves that problem. With real estate video becoming more popular with home sellers we wanted to make sure that our platform could highlight these videos as soon as the tour opened. Now real estate videographers can display their videos along with the property photo gallery, details, top features and an entire presentation, all in one spot.